Chateau / Country House699 sq. ft. The elegant eighteenth century Piedmontese farmhouse situated on the quiet hills of S. Stefano Belbo, the heart of the Langhe, the area recognized as one of the capitals of Italian food and wine tourism and heritage site is spread around the large garden in the shade of the centenary of the maritime pine that characterizes it. 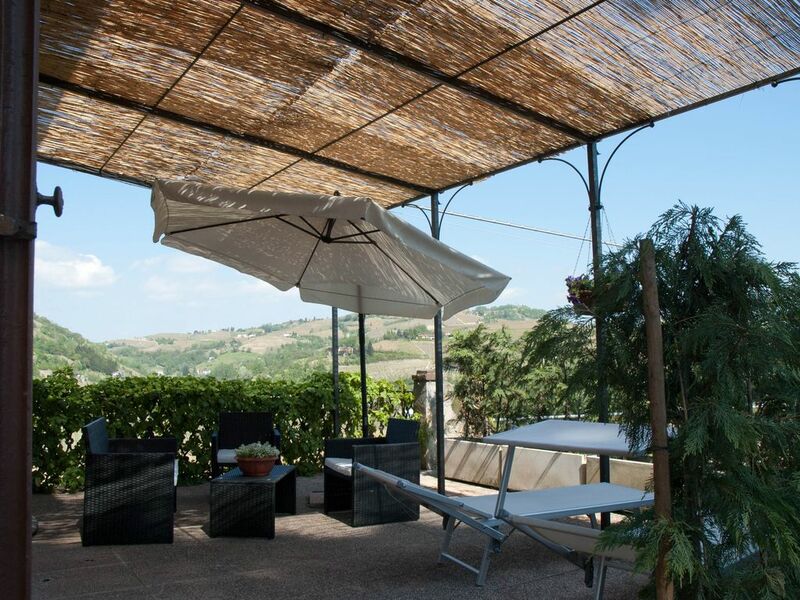 The estate offers the possibility of staying in both rooms with B & B in Apartments: The lovely apartment called pergola measuring 65 sqm + garden and is located on the ground floor of the estate. Overlooking the large garden and consists of two bedrooms, a master and a frescoed room with sofa bed, a bathroom and a living area with kitchenette overlooking the private garden terrace. The apartment sleeps 2 to 4 people, in addition to private spaces, will enjoy the common areas such as the large garden, solarium, children's area, barbecue and pool. In addition to the seal itself, which offers unforgettable moments, the same location of our home is definitely strategic. Santo Stefano Belbo, a country of Langa in UNESCO entrance, and the main production area of ​​Moscato wine, is within 5 minutes' drive from Canelli, famous for its Gancia CASTLE, its subterranean Cattredali and about 30 Km from Alba, for lovers of the truffle or shopping in stores with the most famous Italian brands, Asti, a beautiful city where once a year it also hosts the famous Palio and Acqui Terme, famous for its sulfur springs and the baths or Agliano Terme even closer. The Pavese routes will satisfy the air sports lovers nature such as trekking or mountain biking. Lovers of food and good wine surely will be disappointed not being able to taste unique delicacies to the world as the white truffle of Alba, the meat Fassone, the cardoons, cheeses, hazelnuts, visiting wineries in unique places that create wines unique as Barolo, Barbaresco and many others. Those who are hungry for art and culture as well as being able to visit historic churches and castles countries (some even with guided tour in vintage costumes) will visit the birthplace of Cesare Pavese the foundation and the places described in his poems.